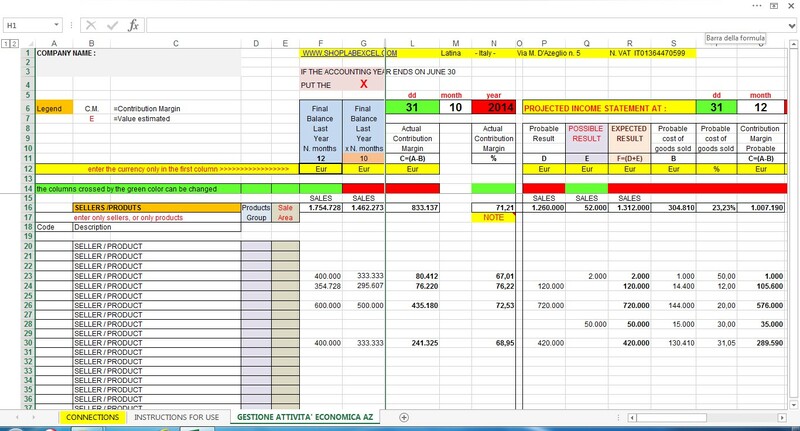 The file, in excel format, it is designed for the control of economic management corporate and the dynamic forecast of the financial results of the year. The images shown below are only indicative and are only partially functioning of the worksheet. The worksheet can be used, alternatively, to monitor the contribution margins of products sold or the contribution margin of product families, or the contribution margins of each seller with respect to the products sold by him. Economic analyzes should, therefore, be related to individual homogeneous categories. The worksheet, as well as being offered, is designed to handle up to 130 products. 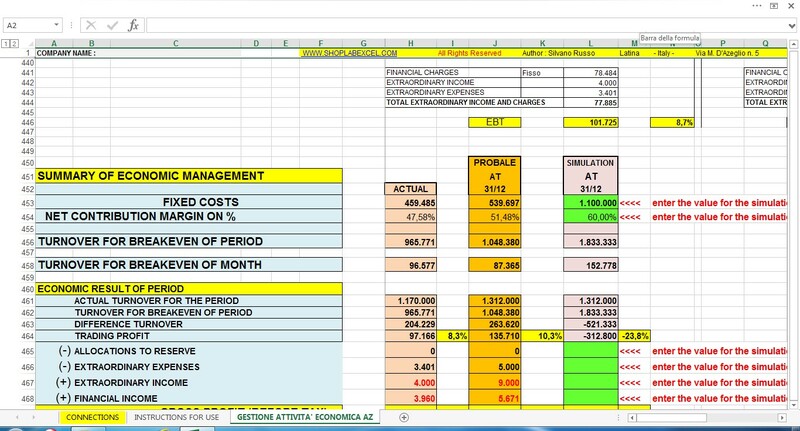 The user must enter in the worksheet accounting data taken from the budget of the previous year and the actual accounting data of current period. Of course, the designation of the items of cost and revenue can be modified and renamed by the user depending on the structure of your chart of accounts in the general ledger. Then, you must take care to insert the cumulative turnover of the current period for each product or family of products or agent. Entering, then, the other information requested in the file, the user can get an overview of the economic business of the current period and a projection of the company's operating results as of December 31 or June 30 depending on the year end . The worksheet can be easily adapted also to companies close their financial year on 30 June. The worksheet allows carry out the management control of the company and to simulate the economic results at the end of the year, acting on the fixed costs and variables or on the contribution margins in order to obtain a point of budget balance always lower. Of course, the changes will translate into goals to be achieved, and these, devranno be monitored continuously. This part of the file highlights, on the one hand, the fixed cost incurred by the company and the net contribution margin achieved in the interim period considered; on the other hand, shows the fixed costs and the contribution margin expected until the end of the year. For both periods, the system will highlight the revenue that the company will have to make to achieve a balanced budget. In addition, beyond the economic forecast period, the worksheet, as it is set, it allows the user to do simulations of break even point arbitrarily changing some parameters.